A very sad post to start the week. 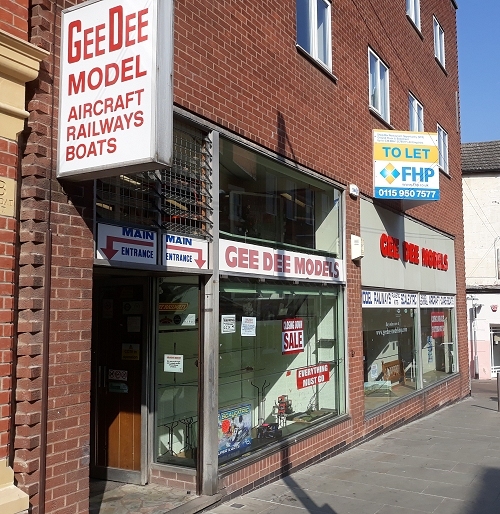 Saturday saw the last trading day of Gee Dee Models in Nottingham. I'd not planned to visit, rushing to the closing down sale of any model shop seems a bit ghoulish, but I was invited to have a look around by one of the people helping clear the decks - and I reasoned they had enjoyed some of my money in earlier years. That might sound strange, but I really can't stand people who have refused to hand over money until there is a stonking great sale on. Model shops are an endangered breed and deserve our support. No-one is getting rich running one, but they provide a valuable service for our community. This doesn't mean the odd packet of track pins or pot of paint, but those big-ticket items too. Maybe you can save a couple of quid on-line, but what's the bigger cost? I digress. The shelves were looking pretty bare when I arrived, but there were bargains to be had and I bagged a few after my tour and a free cup of tea. The place is huge, with considerable storage as well as a generous sales floor. There were a few surprises found when digging to the back of the cupboards, a good model shop builds up a nice bed of odd things over the years that are nuggets of gold to a certain type of modeller. The very first branch opened in 1946 so we are talking about a business with 73 years of trading, only closing on the retirement of the owner now into his 80s - who dropped in to see the final closure. The photo above comes from the Gee Dee website, well worth a look for pictures showing a superb model shop in its heyday. 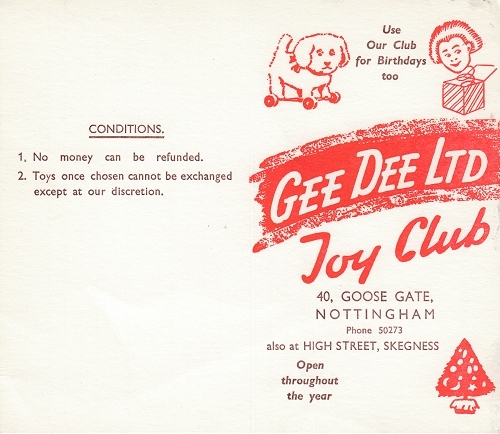 Among the goodies found were some "Joy Club" cards used by shoppers in the 1960s to save up for items. You would come in and pay your money into the savings scheme and eventually be able to afford the Hornby Dublo locomotive or Aerokits boat you desired. At one point there were 4000 members, all records being painstakingly recorded by hand - no computers in those days! 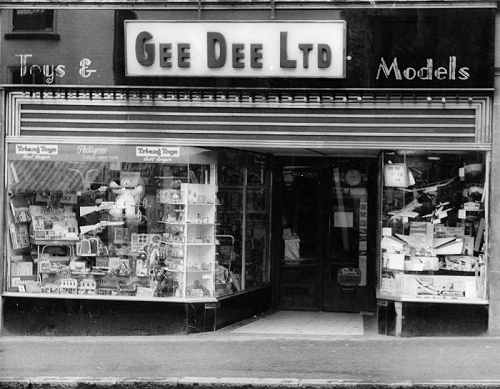 Gee Dee was a proper, traditional shop covering all branches of the model-making hobby. Railways, radio control boats/planes/cars, plastic kits and diecast collectables filled the shelves in all scales. The train area might have been mostly OO and N, but 7mm and G scale were also well represented. I remember my first visit back in the mid-1980s. My dad and I had taken the train to the Nottingham show, it being (correctly) suggested as one to visit by our new model railway club colleagues. After enjoying the event and a hearty chip-based meal at the ice rink where it was held (the lady serving seemed to consider a bag of frozen chips equalled two portions) we walked to the store and were in heaven. A few years later, when building Melbridge Dock and needing some boat fittings for the scratchbuilt Clyde Puffers, we dropped in and were allowed to raid a stack of tiny plastic drawers in one of the cabinets. I've never seen such an array of model boat fitting in a shop since. Some of those we bought are probably still in our drawers as it was a long way to travel, so we stocked up! Every visit to Nottingham since has centred on a visit. Much as I like the city, it's great to have a focal point and I never left empty-handed. Sadly, this has all come to an end. The shutters came down and the lights were turned off. Those shelves still have goodies on them, although there were more spaces at closing time than when the doors opened. I went for a beer with the staff afterwards. Obviously, they will miss the place, many having worked there for years and all being modelmakers themselves. Everyone seemed in good spirits despite the occasion. The people of Nottingham will have lost something important too. Some will call me stupid and sentimental, after all, we have the Internet so who needs a physical shop when you can order your latest Bachby locomotive sat in your pants at home? Places like Gee Dee are more than just a shop for buying things. Peter, the boss, explained that if you want to talk football, you can go to any pub. If you want to talk model railways (or boats or planes) you can't do that. Maybe you are lucky enough to belong to a club to sate your need to chat, but for a lot of people, this isn't an option. In a good model shop, you can discuss the things you make, the hobby you love, and no-one thinks you are weird. Because if you are weird, so is everyone else in there. At least we can be weird together. I do try to use such shops rather than the internet when I can. Unfortunately there are none anywhere near me. A generous tribute on a sad occasion. It was good that you were able to join the staff afterwards, perhaps representing all of us who are sad to see the shop close. 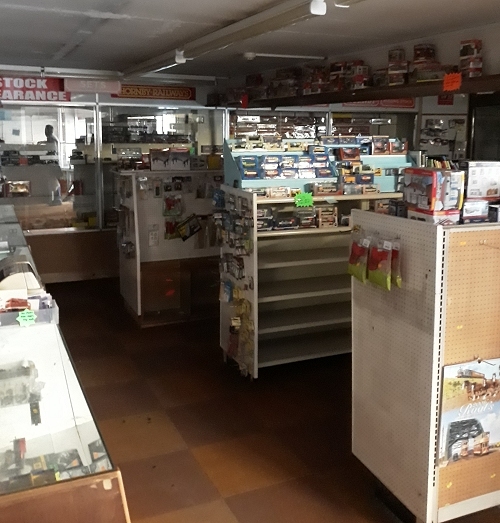 In North Hertfordshire we are fortunate to still have a classic model railway shop in K and S models of Stevenage - for the time being, anyway. Frank's comment above shows that the trend to closure of High Street shops isn't just a British phenomenon. Very sad - I enjoyed those wonderful shops that he describes on annual family holidays in Cologne.